Breakfast is important. Your mom told you. Your teachers told you. The breakfast cereal people LOVE to tell you. If you're a breakfast rebel who doesn't feel the need to eat upon waking, this on-the-go recipe is perfect for you! The truth is, breakfast doesn't need to be inhaled the moment your feet hit the floor in the morning. Not everyone has an appetite immediately upon waking. If you are the five-small-meals-a-day type, you probably eat breakfast early. If you're expecting a little one & suffering from morning sickness, you might have trouble working up an appetite first thing. If you eat 2-3 solid meals that leave you full for several hours, you might not have breakfast until you've had a cup of coffee. Maybe you wait and eat breakfast after the kiddos are at daycare & you're comfortably tucked into your cubicle, safe from lego and poopy diapers. Metabolism doesn't fluctuate so wildly that you can't wait an hour or two to feed yourself in the morning, and waiting until you are actually hungry is simply responding positively to your body's cues. So stop feeling guilty if your face is not planted into a bowl of steel-cut oats at 5:45 a.m. every weekday. Do think ahead, however, and be ready for a nutritious meal when the moment strikes you! A mama's morning is hectic, and preparing something fresh, hot, and protein-packed every morning is not doable. And we all love a muffin, but turning a muffin into a complete meal to power you through your morning and keep you away from the pastries in the Starbucks case requires adding a lot of other components to that muffin meal . . . like protein. Fats. Fibre. OK, basically everything. And, chances are, you are supplementing your muffin with coffee, not eggs and spinach. Plus, eating eggs for breakfast has been proven to help you avoid cravings later in the day, and aid in weight loss. Here is one of my go-to recipes to prepare on a Sunday, arming me with breakfasts on-the-go all week. 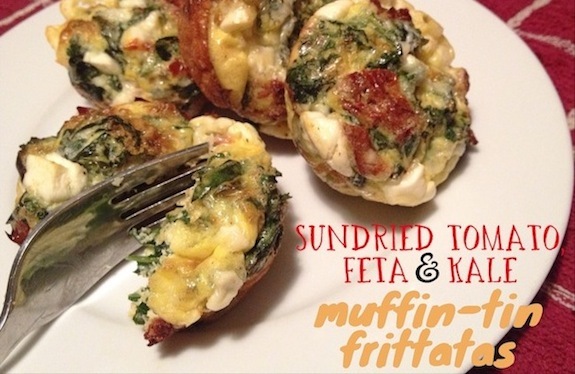 Two of these delicious muffin tin frittatas plus a piece of fruit, and I'm good to get through my morning and my daily BB class! The kids will have one with a side of yogurt and fruit. And a side of ketchup, if we're being honest -- whatever gets the protein down. Check out the basic recipe if you'd like to change the ingredients to your family's tastes. Ham + cheddar? Tomato + green onion? Broccoli + feta? Yum-o.